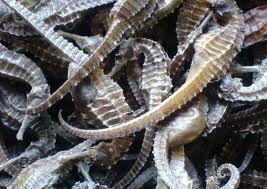 Seahorse/hippocampus (Hai Ma) is classified as sweet, salty and warm. It enters the Kidney and Liver channels. It has been used in traditional Chinese medicine to tonify the Kidneys and fortify yang (for impotence, urinary incontinence, deficiency wheezing and debility in the elderly), and to invigorate the blood (for bleeding and pain from blood stasis, and swelling due to sores and boils). It was also used to promote labour and is therefore contraindicated in pregnancy. Seahorse is also used - in food - as a tonic. 1. Chinese Herbal Medicine Materia Medica, 3rd edition, by Dan Bensky, Steven Clavey & Erich Stoger, Eastland Press, Seattle, 2004.